The glands in the eyelids make the tears that lubricate our eyes. These are not the reflex tear glands that make our emotional tears, but the baseline tear production glands. The openings to these baseline glands can become plugged up. This happens quite frequently actually. The same plugging up occurs in meibomianitis, acne rosacea, blepharitis, and styes. These common conditions can be controlled by simple techniques that you can do at home. This technique is warm compresses/lid scrubs which is the initial treatment to use. But, you have to do them everyday for the rest of your life in order to control the symptoms. The directions on how to perform this technique will follow at the end of this section. 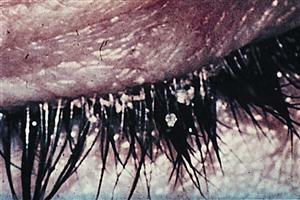 Meibomianitis (posterior blepharitis) is a very common condition. Fully 2/3 of my patients have this to some degree. Meibomianitis is an inflammatory plugging up of the meibomian gland openings that results in worsening of dry eyes, injected eyes, corneal infiltrates, or rarely, corneal ulcers. The corneal responses come from the toxins that the bacteria living inside the glands excrete. Blepharitis (anterior blepharitis) is an inflammatory condition of the eyelash follicles and results in a dandruff-like material deposited at the base of the lashes. It can also give rise to red eyes, worsening dry eyes, corneal infiltrates or rarely corneal ulcers. It is also treated with WC/LS for life. This is a photo of blepharitis or anterior lid disease. Treatment is WC/LS every day for life. This is a photo of meibomianitis or posterior lid disease. 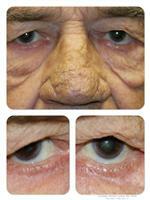 process as the above two just at the outer eyelid area. This is a photo of a demodex (small mite) infection of the eyelids. Difficult to diagnose. The treatment is tree tea oil treatments, which not every doctor believes in. 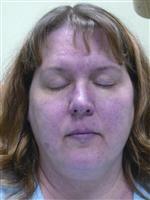 Here are two photos of ocular rosacea patients. Ocular rosacea is another chronic inflammatory disease that plugs up the meibomian glands. The treatment is WC/LS for life. This is a photo of meibomianitis that has a chronic staph infection of the glands as well, secreting toxins that irritate the cornea, causing ulcers in the cornea. (You can see these ulcers as the small white dots above the lower lid in the picture below). The treatment here is WC/LS every day for life with oral antibiotic for a short period of time only. Do you see a trend in the treatments of the conditions above?